Each week I like to take some time to introduce you to some of my favorite new green living finds. Of course I love to tell you about products you can use which will actually benefit the earth, but I really love it when I can show products you can use to go green that actually are easy to use and save you money. You hear it all of the time that going green actually saves you money in the long run but let me tell you what...I want to save some cash now. Am I alone when I say, "Show me the money!"? So with the thought of making conscious consumer choices to not only save our planet but to save some cash right now, you should meet Stephanie and Tana and get to know their Envirocorp's Envisack, Envitote and Envipal. My favorite Envi product has to be the Envisack (sold in packs of 2) and if you are like me and hate to spend money on those stupid gallon sized plastic bags that take forever to degrade in the landfills and cost you a chunk of cash each week at the market, you are going to love them too. I used to find myself using a ton of gallon sized plastic bags and it always irked me when I threw them away cuz I knew they were going to take forever to degrade and I hated wasting money on them. Now I love Envisacks and can use them in lots of different ways; replacing my expensive Ziploc storage bags. 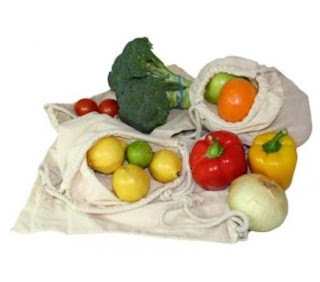 Plus, now when I shop, I can put my produce right into my little cotton, canvas Envisack and I never have to mess with recycling those plastic bags from the supermarket. You will find so many ways to use your Envisacks. Use Envisacks to hold things like Barbie shoes and other kids toys with a million pieces because they are great for packing and storing anything. Envisaks are one of three green living solution from Envicorp which is another one of my incredible green suppliers for Environmental Booty. I am really happy to be able to share not only their Envirosack, but also their Envipal and Envitote with you. I hate green washing just as much as you do and I promise to always introduce you to suppliers and manufacturers who are genuine in their green offerings. Envicorp offers great green living solutions to make your life healthier and our planet a bit greener, and they do it out of a true passion to help people save our world. Using Envicorp's products means you are reducing consumer waste and saving our planet. They really believe that using their products can help you to save the earth and I believe using their products will help you save money too. For example, if you are sick of recycling plastic or paper bags and want the only Eco-saving solution for getting potato chips home in one piece, you will want to pick up a few Envitotes. No more wasted money on crushed bread, buns or eggs as the bag will not collapse in on itself. 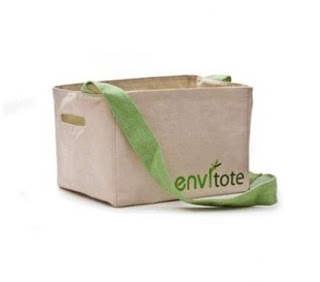 The Envitote is a washable, truly unique Eco-saving solution for your shopping needs. 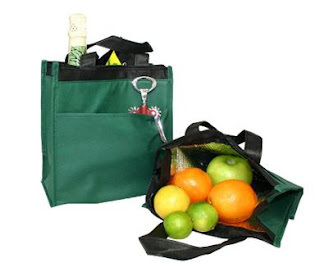 Plus, if you have a bad back like I do, you will love the ease of carrying these sturdy bags by the convenient handles. I also love the lead-free Envipal which is the most Eco-friendly lunch pack/insulated carrier on the market. It is really the perfect size for lunch or for carrying a few frozen items from the supermarket. If you haven't discovered how much money you can save on packing lunch instead of buying take-out, pick up an Envipal and start packin'. I really admire the two Houston based friends, Stephanie Collins and Tana Collins who started the business in 2009 out of a true desire to provide products that allow individuals to live a more environmentally conscious lifestyle. Stephanie and Tana really want to affect a positive change in consumer attitudes and the environment by providing Eco-friendly products. I thank them both for creating three products that create a positive impact on our planet and our pocketbook. At a price that is compatible with most household budgets, Envicorp's three little creations will give you a great, green return on investment...cash in your pocket and the knowledge that you are a part of creating positive change for a healthier world. This seems like a great product--convenient and green. I hate plastic grocery store bags. In addition to being bad for the environment, they're a hassle to deal with. As always, I appreciate your green living tips! Thanks Sharon, Nice to know you like the tips. I am really trying to find ways that going green really pays for all of us. Thanks for stopping by. I have always think that plastic bags, and product packaging do a big harm to environment! Thank you for sharing this! Hi there, nice to see you. Now if we can just get everyone on board with using products that recuse plastic use, we will be on the right track! Plastic has to be abandoned and thrown away...all of it ans recycling materials used for bags and carrying purposes.This is a lovely idea here. DVC, not only are these bags great for our planet but they really offer a way to save money. I agree, these ladies have a great product!